(Newser) – The Vatican has an unusual dilemma after nearly all the nuns in a tiny French religious order threatened to renounce their vows rather than accept the Holy See's decision to remove their superior. The sisters argue that the Vatican commissioners sent to replace their superior general, the niece of the order's founder, have no understanding of their way of life or spirituality. The church's conclusion—in a summary of its investigation—is that the Little Sisters of Marie, Mother of the Redeemer are living "under the tight grip" of an "authoritarian" superior and feel a "serious conflict of loyalty," reports the AP. The standoff marks an extraordinary battle between the Vatican and the 39 nuns, most in their 60s and 70s, who run homes for the aged in rural western and southern France. Their threat comes at a time when the Catholic Church can hardly spare them, with the number of sisters plummeting. The unlikely revolt had been brewing for years but erupted in 2017, when the Vatican suspended the Little Sisters' government and ordered the superior, Mother Marie de Saint Michel, removed. 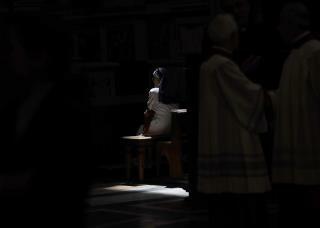 The Vatican says local church investigations in 2010 and 2016 found excessive authoritarianism in her rule and serious problems of governance. As the standoff escalated, 34 of the 39 nuns issued an extraordinary declaration last month saying they had no choice but to ask to be relieved of their vows. "We are not making this sacrifice lightly," they wrote. "We wish to remain in total communion with the church but we cannot signify more clearly, or more painfully either, our incapacity in conscience to obey what we are commanded to do." Their plight has garnered sympathy. A French support group claims to have 3,900 signatures for a petition demanding the immediate restoration of the order's central government. Read more here. And the Vatican prefers guys rather than have competing Tall Order Nuns.